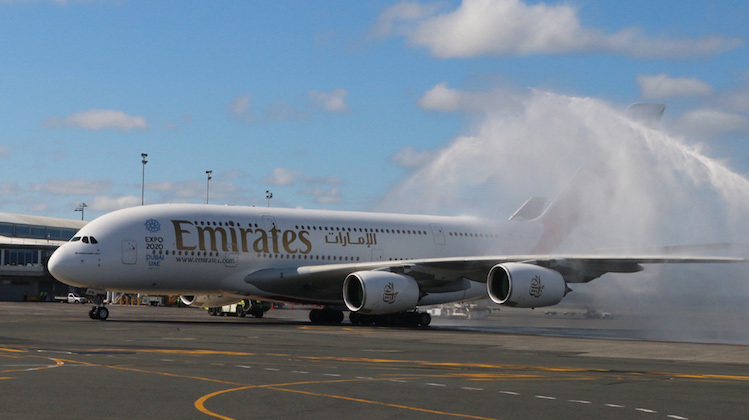 Emirates has claimed the title of the world’s longest passenger flight from alliance partner Qantas after its nonstop Dubai-Auckland service touched down in New Zealand on Wednesday morning. Flight EK448, operated by Airbus A380 A6-EON, landed just before 1000 local time – after a 14 hour and 40 minute journey – and was met with a water cannon salute on its way to the terminal. The use of the A380 is a one-off to celebrate the inaugural service, with Emirates to ordinarily deploy the Boeing 777-200LR for the 7,668nm route. The reciprocal flight, EK449, is scheduled to depart Auckland at 2130 local time. Emirates said prior to the start of the Dubai-Auckland route it has worked with air traffic controllers, including Airservices and Airways New Zealand, on flexible route options, meaning the actual flight path can change depending on conditions, in an effort to minimise flight times and reduce fuel consumption. The majority of the Dubai-Auckland flight will be in Australian-controlled airspace, Emirates said, adding it had worked with Airservices on flexible route options on its Australian-bound flights for the past decade. “The organised track system – AUSOTS – is well-proven and extending that program so that it is specific to the Auckland-Dubai route will have significant benefits, without impacting the operations of other aircraft going to Australia,” Emirates vice president for flight operations support services and air traffic management Geoff Hounsell said in a statement on February 23. Airservices executive general manager for air traffic control Greg Hood said the use of Flex Tracks and user preferred route (UPR) zones helped Emirates find the most optimal routes. “Airservices Flex Track and UPRs will help Emirates realise significant savings in fuel, reduce its greenhouse gas emissions and reduce the flight time with seasonal and daily variations based on the positioning of jet stream winds,” he said. The Dubai-Auckland route eclipses Qantas’s Airbus A380 route between Sydney and Dallas/Fort Worth, which clocks in at 7,454nm according to the Great Circle Mapper and previously held the title of world’s longest passenger flight. The start of Emirates’ nonstop flight to Auckland will shortly be followed by the arrival of another new service from the Middle East to Oceania, with Qatar Airways’ Doha-Sydney inaugural, QR908, scheduled to touch down in Sydney at about 1800 local time. Four A380s on the ground a day? But the article says the service will be operated by a 77L after today? Isn’t Singare still flying an A380 into Auckland over the Summer period? This would account for 4 A380’s being on the ground in Auckland a day. The extra A380 on the inaugural flight would have made it 5 on this day. Aren’t they resuming direct flights to AKL? I could have sworn there was an A388 service before the BNE, MEL & SYD to AKL flights? In addition to that, yay there will be no reason for Emirates to continue flights between MEL,BNE & SYD. Thinking those longest route will be done mostly by A350ULR in the near future, with only a few done by other type. Some B777-200LR will be replaced. Any airlines can compare the fuel efficiency, payload and maintainence cost between the 2. Until 777-x come up with better, A350-900ULR will be dominate. Currently there are four Airbus A380 aircraft a day into Auckland, three Emirates, and one Singapore Airlines. There’s was four Airbus A380 from Emirates just that once. Further flights were to operated on the direct flight with a B777-200LR aircraft. There has been four A380’s on the ground before when a Singapore flight was delayed. Small note the long haul A380 flight touched down at 10.32.